Hub meetings are designed to connect and engage people by breaking down silos for a more agile approach to problem solving. 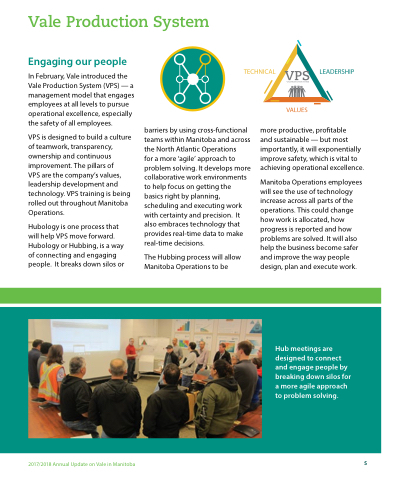 In February, Vale introduced the Vale Production System (VPS) — a management model that engages employees at all levels to pursue operational excellence, especially the safety of all employees. VPS are the company’s values, leadership development and technology. VPS training is being rolled out throughout Manitoba Operations. for a more ‘agile’ approach to problem solving. It develops more collaborative work environments to help focus on getting the basics right by planning, scheduling and executing work with certainty and precision. It also embraces technology that provides real-time data to make real-time decisions. and sustainable — but most importantly, it will exponentially improve safety, which is vital to achieving operational excellence. Manitoba Operations employees will see the use of technology increase across all parts of the operations. This could change how work is allocated, how progress is reported and how problems are solved. It will also help the business become safer and improve the way people design, plan and execute work.